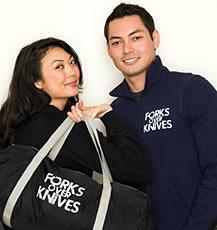 "Forks Over Knifes" merchandise such as totes and jackets are available for purchase. Photo courtesy of "Forks Over Knives" Web site. WHAT will inspire you to change the way you eat, thereby significantly improving your health and prolonging your life? No, not simply to eat healthy for as long as it takes to look better in a bathing suit or to lose those extra pounds or to knock a few numbers off the blood-work results and blood pressure. Are you prepared to make a lifelong commitment to it? What if watching a film could actually save your life? Really. I'm not kidding. Two insightful and powerful documentaries address the health crisis in the United States (and increasingly the world) and offer solutions. They reveal how processed foods are making us sick and what we can do to take back our health – to live healthier, happier and longer lives naturally. Every day, individuals are improving their health and seeing how their lives are transformed by simply eating the way nature intended. Simply Raw: Reversing Diabetes in 30 Days ($29.99) chronicles six Americans with diabetes who for one month switched to a diet consisting entirely of vegan, organic, uncooked foods. They are challenged to give up meat, dairy, sugar, alcohol, nicotine, caffeine, soda, junk food, fast food, processed food, packaged food and even cooked food. The remarkable journey of each participant is tracked as s/he experiences the medical, physical and emotional transformations brought on by this radical diet and lifestyle change. Witness moments of struggle, support and startling clarity that diet can reverse disease and change lives. Forks Over Knives ( $19.99) documents the personal journeys of a pair of pioneering researchers, T. Colin Campbell and Caldwell Esselstyn. The film examines the profound claim that most – if not all – of the degenerative diseases that afflict us can be controlled, or even reversed by not eating animal-based and processed foods. Leading experts on health examine the question "why we don’t know" and tackle the issue of diet and disease in a way that will have people talking for years. It’s a film that can save lives. “Simply Raw: Reversing Diabetes in 30 Days” and “Forks Over Knives” are simple and affordable cures to what ails so many who face ever-increasing healthcare costs. If you, a loved one or friend is challenged with any chronic disease or illness, first consider these particular prescriptions. Reclaiming and retaining health never felt and tasted so good! http://www.forksoverknives.com/ to learn more about the DVDS and to see trailers.